For the last four years I have been a part of the Maple Ridge Pitt Meadows Art Studio Tour. This is a local event designed to give the public an opportunity to visit artists in their studios, see work in progress and possibly purchase some artwork. The main way people navigate the tour is by using the brochure. It lists all of the artists, some information on each one and has a map with the studio numbers. In previous years there were a lot of complaints about its usability. This year I had the opportunity to redesign it. This was a challenging project to work on as it involved working with information from 36 artists. That is 36 highly creative people reviewing your work! 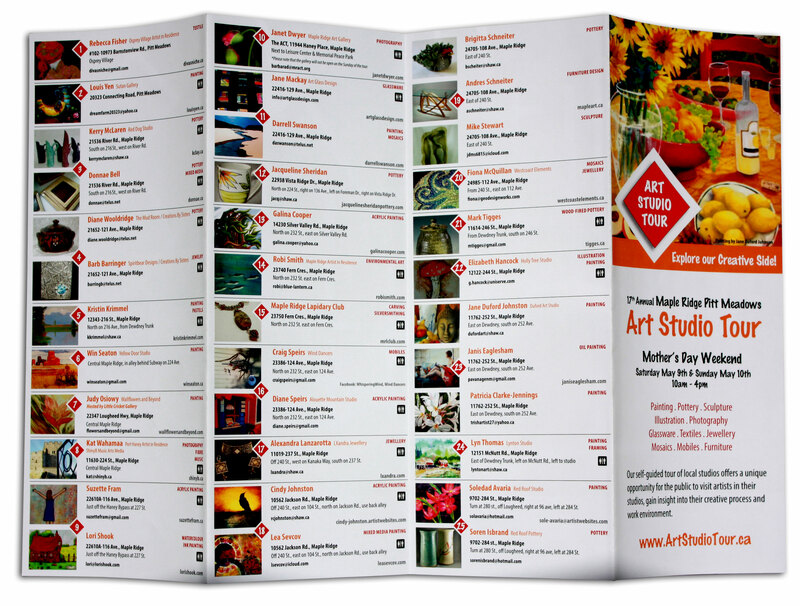 Happily artists and customers both loved the brochure and found it much more useful to navigate this years tour.